It is useful to divide the total space within the lungs into volumes and capacities. These can be measured to aid in the definitive diagnosis, quantification and monitoring of disease. They allow an assessment of the mechanical condition of the lungs, its musculature, airway resistance and the effectiveness of gas exchange at the alveolar membrane while being, for the most part, cheap, non-invasive and simple to measure. In this article we will look at the volumes and capacities within the lungs, how they can be measured and how they are affected by pathology. Alveolar (distributive) dead space is the volume of air that reaches alveoli but never participates in respiration (e.g. due to underperfusion from hypoxic vasoconstriction). 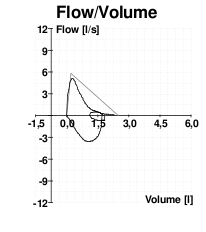 Fig 1 – Diagram showing various lung volumes. How it’s done: Subject breathes from a closed chamber over water. The chamber is filled with oxygen and as they breathe they remove/add gas to the chamber. A weight above the chamber changes height with ventilation. Its height is recorded with a pen to obtain volume inspired or expired over time (flow). Fig 2 – Normal spirometry. How it’s done: After quiet expiration the subject breathes in a gas with a known concentration of helium (an inert gas). They hold their breath for 10 seconds so the helium mixes with air in the lungs, becoming diluted. The concentration of helium is measured after expiration. The dilution factor allows the volume of air participating in ventilation to be calculated. How it’s done: Subject takes normal breaths of pure O2. During this time the concentration of nitrogen in the expired air is measured over time. The nitrogen comes from the alveolar air. Initially dead space air is expired which never reached the alveolar air and so is still pure O2. Then a mixture of dead space air and alveolar air is expired so the nitrogen concentration rises. Then purely alveolar air is expired so the nitrogen concentration reflects that of alveolar air. Can determine from a graph of the results the volume of air that contributes to dead space. 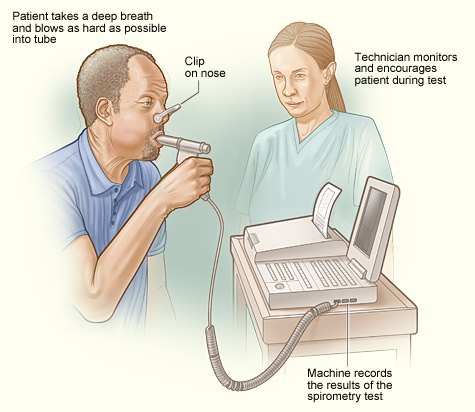 Fig 3 – Image showing the process of spirometry using a spirometer. In obstructive disease the FEV1 is reduced due to increased resistance (and possibly even complete obstruction of airways) during expiration. Air trapping can also occur where more air is inspired than is expired, which can cause the residual volume to increase. In asthma the obstruction is reversible which can aid in diagnosis. This means that FEV1/FVC will recover on re-test after the application of a bronchodilator such as salbutamol. Examples of obstructive diseases are asthma, COPD (chronic bronchitis, emphysema), tracheal stenosis and large airway tumors. 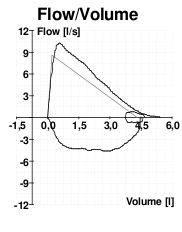 Fig 4 – Spirometry of a patient with asthma, a restrictive disorder. Examples of restrictive diseases are interstitial pulmonary fibrosis, muscle weakness, kyphoscoliosis, obesity, tense ascites. The extra volume that can be breathed out below tidal volume to maximum expiration is known as which of the following? Which of these is equal to the sum of the Expiratory reserve volume and the Residual volume? Which of these patient factors has the greatest influence on the FVC? What is nitrogen washout used to measure? Which of these findings would NOT suggest a restrictive pattern of disease? Which of these conditions could demonstrate an obstructive pattern of disease?